British Virgin Islands (BVI) is one of the oldest and most respected offshore financial centres in the world. BVI is widely considered as a benchmark, which the other offshore tax havens strive to emulate. 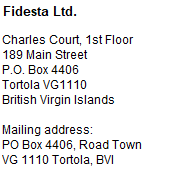 Fidelity Corporate Services Ltd is a professional offshore incorporation services firm. We are located in the British Virgin Islands and we specialize in BVI Business Companies - probably the worlds´ most popular type of offshore company. We are a source provider, not an intermediary. For our clients, that translates into expert service, competitive fees and quick turnaround time. Our firm is licensed by the British Virgin Islands Financial Services Commission under the BVI Banks and Trust Companies Act 1990, Licence No GTL 14006/06. As such, we are regulated and supervised by the FSC in regards the quality of our incorporation and company management services, the competence of our staff and the safeguarding of client interests. Along these lines, we are subject to substantial capital adequacy requirements and carry professional indemnity insurance. Our services include offshore company formation in British Virgin Islands and subsequent management and administration of such companies, including services of the Registered Agent, provision of the registered address, third-party directorship and company management services, shareholders, services, virtual office and secretarial services, bank account introductions, custody of documents and corporate searches, preparation of corporate and business documentation and general administration. Our clients are private entrepreneurs as well as professional intermediaries such as tax consultants, financial advisors, accountants and lawyers. Our client base is purely global, reflecting on the worldwide popularity and recognition of BVI as an offshore tax haven. Being part of the Fidelity Overseas group, with affiliate offices in several other offshore centres, we provide our clients with local expertise in conjunction with a global perspective, supported by more than 10 years experience in the offshore financial services business. We welcome You to browse through our site, which we have tried to make as informative and functional as possible. Please feel free to contact us if You need any further information about BVI offshore companies and services - we will be delighted to write or speak to You!